Cavalier King Charles Spaniels have so much in common with historical costuming: the breed is a reproduction of an extinct breed based solely on portraits and accounts written by people long dead. 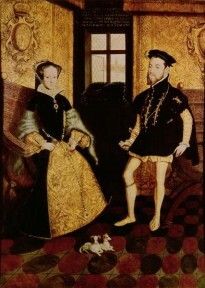 Mary I and Philip of Spain and their spaniel. They were popular in the 16th century. 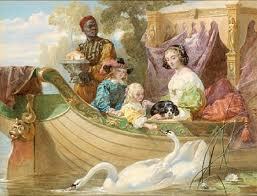 In the 17th, they were the epitome of aristocratic companionship. 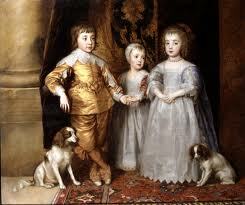 King Charles never went anywhere without his spaniels. Both fashion and dogs have geneaologies, as they are born from lineages and mutations. No dog breed, or fashion can exist without a history and origin of it’s components. Dog breeding, like fashion and clothes, has it’s roots in the quest for human delight, pleasure, and comfort. Genetic analysis of dog breeds has determined that humanity originally bred dogs with the purpose of companionship in mind, which is not really what one would have guessed. One can imagine that the life span of working dogs in the early stages of mankind was pretty short, so numbers – not quality – would have been most important. If they did breed their working dogs, geneticists have been unable to find any modern evidence of the fact. But there is evidence that when mankind started breeding dogs it was temperament, not strength or work-capacity. And a Cavalier King Charles is a perfect example of a dog meant solely for companionship. Non contemporaneous depiction of King Charles`French Queen. 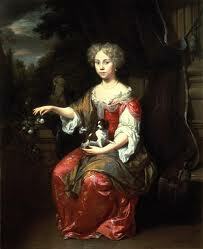 She is depicted as maternal: floating in an idyllic existence with her children and a beloved spaniel. Yet, my purpose here is not to discuss the merits of this docile, non-aggressive, loving breed, or it’s eager quest to find a warm friendly lap on which to relax. What does interest me about the breed, and what it shares with historical costuming, are the origins of it’s modern form. A small pup on the lap of a lady. Numerous portraits with King Charles Spaniels exist, and served as part of the basis for the 20th Century reconstruction of the breed. In the early 20th century, an eccentric millionaire offered a sizable sum to any dog breeder who could reproduce the King Charles Spaniel from the 17th Century. Dog breeder associations had a good laugh at this amateur, rather pointless (to their minds) effort to recreate a dead aesthetic. Sadly, the gentleman who started the project died before it reached its completion, a completion it almost didn’t reach. During World War II, the quest for the 17th century spaniel of the decapitated king was nearly lost yet again. The leading kennel which was making the effort found their 60-dog kennel cut back to 5 or 6 dogs as a result of war rationing, general lack of resources, and waning support for an whimsical project to breed a toy dog belonging to an absolutist king. It is from this small surviving population that all modern Cavalier King Charles Spaniels descend. Last of the long-nosed King Charles Spaniels (early 19th Century) before crosses with the fashionable Victorian pug turned their noses up forever. Historical Costuming and the Cavalier King Charles Spaniels have a great deal in common, therefore. 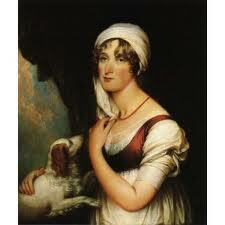 They were both reproduced from beautiful period portraits, drawings, and written accounts of people long dead. They were both endeavors born from eccentricity and nostalgia. And both are very friendly, very non-threatening, beautiful to look at, and they keep you nice and warm. Why am I writing about these dogs? Because I just got one. She is a beautiful, Blenheim blue blood and such a lover!